Our awareness on things that exist teaches us two definite things: possibilities and impossibilities. Possibilities are positive. They make us think, prepare, work, and plan on expected eventualities. Impossibilities, on the other hand, are negative. They erase expectations, make us decide definitely, and worse, sometimes make us not to think anymore and dismiss everything associated with known impossibilities. The Holy Bible, as a book written many millennia before our time, is a book that teaches us possibilities and impossibilities. A reckless reader may at once judge ignorantly that the Bible is unscientific, full of errors, fictitious, and unacceptable to the scientific mind! There are things written in the Bible that at first glance may appear to be non-sense to one but intriguing to others. Having an evening and morning on “the first day” of creation, for example, while the sun and the moon were yet to be made on the fourth day is very easily dismissed by the enemies of the Bible as something stupid and unscientific! 16 And God made two great lights; the greater light to rule the day, and the lesser light to rule the night: the stars also. The common question that comes from common understanding of people reading these verses is this: How can there be an evening and morning on the first day when the sun and the moon were made only on the fourth day? And thus, a prejudicial judgment is rendered upon the one and only book on this planet that describes the origin of its existence and the teeming multitude of life in it! 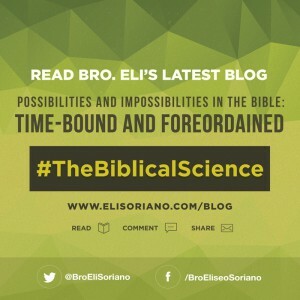 Possibilities and impossibilities – incidental, scientific facts, (discovered and yet to be discovered) must be collectively considered in order to pass on a fair and equitable judgment upon the Bible before concluding that it is unscientific or not. Possibilities must be considered in harmony with past, present, and expected possibilities in the future, in the same manner that impossibilities – past, present and future – can be used as tools in analyzing the recorded stories, histories and beliefs written in the Bible. The appearing of dry land from a globe of waters. The appearance of light from utter darkness. The existence of vegetation in the absence of the sun. The putting of lights in the firmament to light upon the earth on the fourth day of creation. The earth bringing forth vegetation and animal life. The waters bringing forth aquatic life and fowls of the air. The creation of man from the dust of the earth. Man living an age for almost a thousand like Methuselah. Producing a living being with the same materials from the host. To produce humans from animals. To produce another specie from a given one. For the universe to be ever expanding. For the universe to start from a bang. For the light to have communion with darkness. For the universe not to be in perfect order. All of these are time-bound and foreordained. In the first, it means things came to be on account of time. In the second, it means someone decreed them to be so – and unalterably so. Let us go to judging – as it is connected to judging the Bible, or judging truth. Open-mindedness is a must for a judge. A wise judgment considers possibilities and impossibilities and even sometimes instincts in humans. A very famous judgment rendered in the Bible is when Solomon commanded that a child be cut into halves when two supposed mothers were claiming the same child. In the preceding verses the king considered possibilities and impossibilities before rendering judgment. The possibilities were: 1) Either of the women is the mother; 2) One is telling the truth and the other is telling a lie; 3) Both of them love the child; 4) One loves the child and the other does not. 5) One of them is involved in the exchange of babies. And other possibilities. Considering the period wherein they lived, the impossibilities were: 1) DNA test; it was not possible. 2) CCTV cameras to review who really overlaid the child; they did not exist before; 3) Witnesses to the incident; no one saw the culprit; and 4) Two mothers: the child can only belong to one. But the wise king harnessed maternal instincts to know the truth and to render absolute judgment. In the absence of evidence and witnesses, the king utilized the God-given instinct of a mother to her own flesh: she would not have her child be sawn in half. Let us journey back in time and consider past possibilities and impossibilities, as well as consider future possibilities and probabilities after which we can conclude if really the Bible is fictitious, a fairy tale, a book written by stupid people, or the most exact scientific book of all times. Here is the assurance of the God of the Bible who cannot lie. Next StoryBro Eli Tells Brazilian Pastor on Debate: Be Biblical!